Mussels Mytilus edulis. When different animals exhibit a common pattern of abnormal closings (or openings), it means there is a common external stress (that can be pollution). Otherwise, each individual in the group, except for biological rhythms, lives its life independent from one another. Dalnie Zelentsy is a bay in the North East of Murmansk in Russia. We are working there since October 2012 in cooperation with the Murmansk Marine Biological Institute and the French Gas & Petrol Company TOTAL. 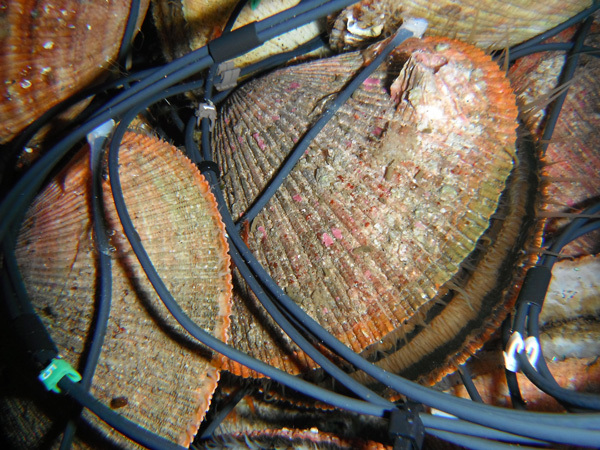 In early October 2012, we have set an HFNI Valvometer equipped with 16 mussels Mytilus edulis. We performed a standard exchange of our submarine electronic in early October 2013, with a new set of mussels. The whole system was placed back in the Bay on October 7, 2013 from 10 -12 a.m.